Photography is built on the three pillars of exposure: shutter speed, aperture and sensitivity. Shutter and aperture are controls for adjusting how much light comes into the camera. How much light is needed is determined by the sensitivity of the medium used. That was as true for glass plates as it is for film and now digital sensors. Over the years that sensitivity has been expressed in various ways, most recently as ASA and now ISO. The "normal" range of ISO is about 200 to 1600. With today's digital cameras you can sometimes go as low as 50 or as high as 204,800. The number chosen has two important qualities associated with it. First, it sets the amount of light needed for a good exposure. The lower the number, the more light required. The more light that's required, the more likely a slow shutter speed will have to be used. That means low ISOs, like 100 or 200, are most often used in bright situations (like sunlight) or when the camera is mounted on a tripod. If you don't have a lot of light, or need a fast shutter speed, you would probably raise the ISO. 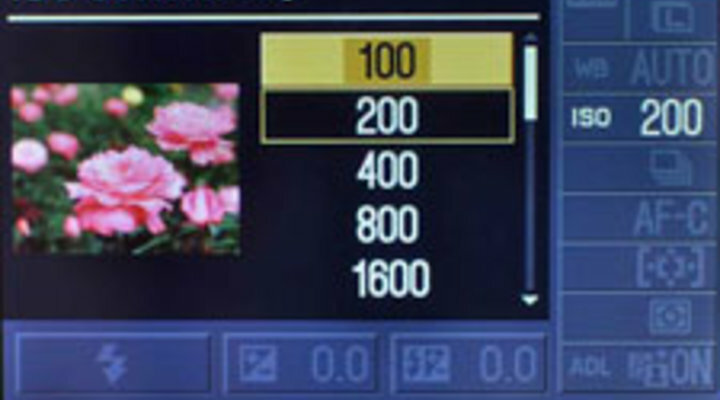 Each time you double the ISO (for example, from 200 to 400), the camera needs only half as much light for the same exposure. So if you had a shutter speed of 1/250 at 200 ISO, going to 400 ISO would let you get the same exposure at 1/500 second (providing the aperture remains unchanged). This is why high ISOs are so often used indoors, especially at sporting events. Needing a fast shutter speed to stop action, photographers regularly choose ISO 1600 or above. The other important quality tied to ISO is the amount of noise in the image. In the days of film, as you used film with higher ISO values (often referred to as ASA then), your images had more visible grain. Film grain is what made up the image, and higher numbers resulted in larger grain, which was more obvious. Most people found visible grain objectionable and so photographers worked to avoid it when possible. In digital cameras, raising the ISO means a similar decrease in quality, with an increase in what's called "noise." It's the digital equivalent of grain and results in a sort of "chunky" look to the image. Very early digital cameras had objectionable levels of noise at ISOs as low as 800. Today most digital SLRs can make good quality images at ISOs up to 1600 and above. However, several variables affect this. One important factor affecting the amount of digital noise in an image is the size of the pixels used on the sensor. Large pixels result in less noise than small ones. That's why digital SLRs perform much better at high ISOs than compact cameras. The SLRs have larger sensors and larger pixels. Another factor is the amount and type of noise reduction being applied in the camera. Because all pixels collect some noise, every digital camera runs processing on every image (although with a NEF, or RAW, file that can be changed later) to minimize that noise. Newer cameras use newer technology to reduce that noise, with the result being less noise at similar ISOs than what earlier cameras could achieve. All of this means photographers are constantly doing a balancing act. They want to keep their ISO low for high quality images (low noise), but also they need a fast enough shutter speed to get a sharp picture. That's why there's such high value placed on groundbreaking cameras such as Nikon's D5, D500 and D850 that allow photographers to shoot at higher ISOs with less noise than ever before. Auto ISO was introduced into digital cameras several years ago to help photographers manage that balance. Turning on that feature allows the camera to push the ISO up when it decides the shutter speed is getting too low for a good picture. Even better, newer Nikon cameras have added "ISO Sensitivity Auto Control" to the menu choices. This takes Auto ISO and lets you have some say about what happens. Using it, you set the limit for how high it can go (800? 3200?) and at what shutter speed it should start raising the ISO (1/125? 1/30?). The amount of control this feature allows means more photographers will start taking advantage of it. A solid understanding of ISO will help you make smart decisions about how to set your camera. And that, in turn, will lead to better pictures.